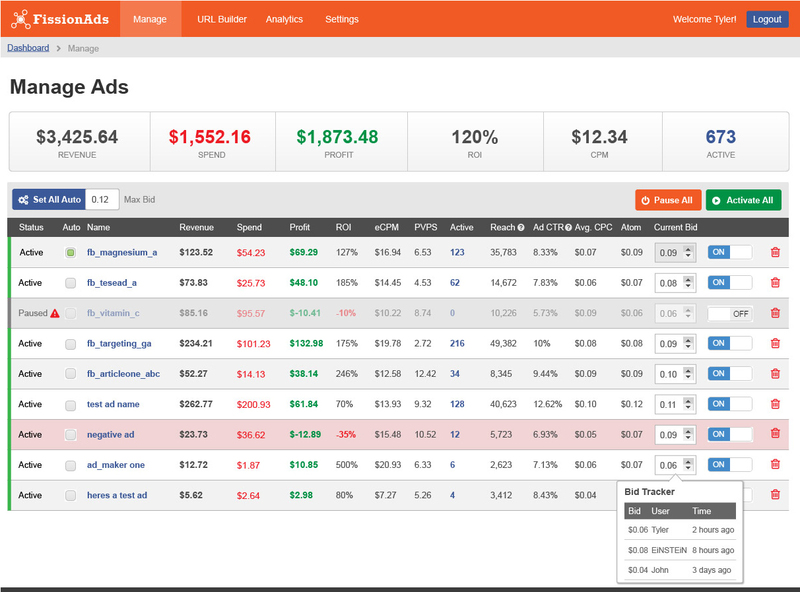 FissionAds LLC announced the launch of their flagship software platform that automates online advertising. The innovative platform connects online advertising channels to revenue streams to see real time ROI, Profit and CPA. FissionAds LLC announced the launch of their flagship software platform that automates online advertising. The innovative platform connects online advertising channels to revenue streams to see real time ROI, Profit and CPA. Using deep data analysis, their patented Einstein Algorithm changes ad bids in real time and automates your entire advertising process. The platform is currently in Beta for a few select customers and will launch to the public on May 11th, 2016. FissionAds is a premium, internet-based web solution that offers the entire online advertising process in one single place. The platform integrates all advertising sources like Facebook Ads, Bing Ads and Google Adwords allowing clients to manage all advertising solutions on FissionAds’ innovative platform. The software has a data driven algorithm knows as the Einstein Algorithm that uses performance based ad data to automatically change bids based on a target ROI that the user can set. Connect revenue streams like Adsense, Lijit, Yieldbot, Shopify and many other sources to see real time revenue, profit, spend and ROI per advertising campaign. “When running online marketing campaigns, you have way too many pieces to manage. FissonAds is a simple yet innovative platform that allows you to manage all these pieces on one place. Whether you have an e-commerce store or a content network, FissionAds allows you to save time by automatically managing your online advertising and see your bottom-line in real time,” said CEO Tyler Horvath.